This is an intersection of the hobby today that I know nothing about, so I don't know what it means to have Tycho (Jerry Krahulik iirc) authoring a book via Acquisitions Incorporated as an official D&D product through WotC. I mean, I know what the last part means...the unannounced new setting is clearly this thing, whatever it is. 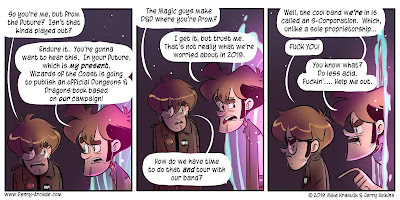 But I haven't really got a clue what the setting is, or why it is, other than that the Penny Arcade comics have been a consistent source of amusement for me for twenty years now, something few other online comics have held up to over time. And as far as I know Acquisitions Incorporated is...I think...a youtube channel or something where people dress up and play D&D? Or maybe they do it at the PAX conventions that I'd love to attend someday? I am not sure and their website is surprisingly ugly. I don't have the time to go down that rabbit hole these days so I guess I'll just let some future setting book surprise me completely. Kind of like how Ravnica got to be a new thing for me since I know nothing of Magic after about 1995. I guess we'll know later this year! 0 Response to "Penny Arcade and Acquisitions Incorporated doing an official D&D Setting with WotC"